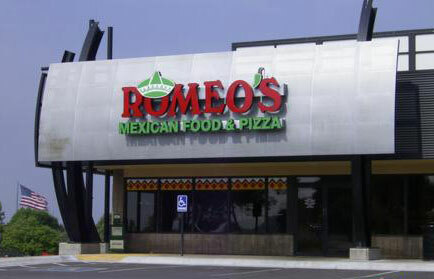 As their website states, Romeo’s opened the doors to their first restaurant at 90th and Blondo in Omaha in 1976. Now with five Omaha area locations, there’s sure to be a Romeo’s near you. It’s odd to find a Mexican food restaurant serving up pizza, especially a Mexican restaurant that highlights pizza in their name, but that’s exactly what Romeo’s has been doing for nearly the past 40 years. A few nights ago we took the short drive to their West Center Road location on the hunt for pizza. After snagging a front row parking spot, we were quickly shown to our booth where we immediately ordered a couple of cold beers. We decided to get our standard pizzas: a veggie pizza and a pepperoni pizza. After a short wait our pizzas had arrived. The veggie pizza was presented on a white plastic dinner plate and the pepperoni pizza on a plastic pizza tray. Why the two different ‘trays’? We thought the difference was that the veggie was a small while the pepperoni was a medium. As our server informed us, Romeo’s cooks their pizzas in a traditional deck oven and by looking at the bottom of the pies, they cook them on pizza screens as well. 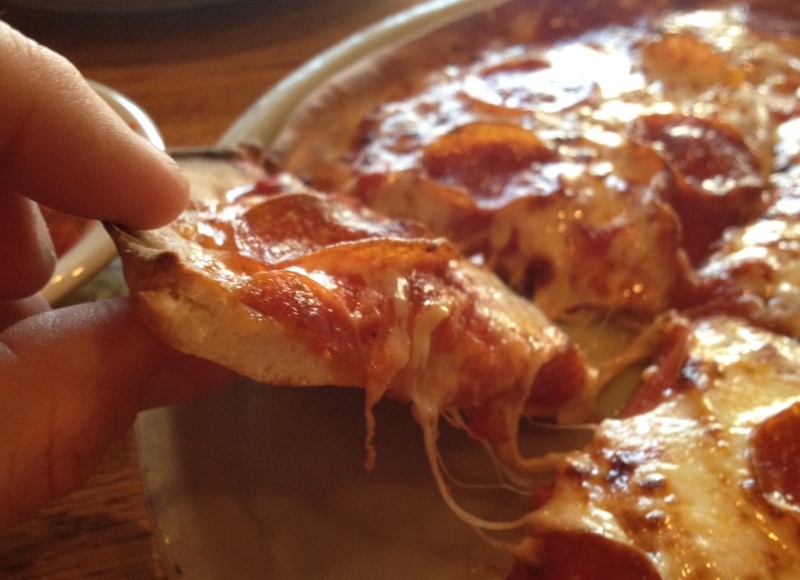 The crust at Romeo’s is of medium thickness coming in at around 3/8″ thick. The outer rim of the pies had a bit of char on them and were pretty crusty. Overall the crust was doughy and a bit under-cooked, even though the bottom was done. In our opinion, there is certainly nothing special about the base of their pies. The sauce here was pretty average for a simple pizza sauce. You get the sweet from the tomatoes and not much else. If they use any herbs and spices, they use them sparingly. One note is that the sauce had a few larger chunks of tomatoes, which added a little texture to the sauce. The veggie pizza was a traditional vegetable pizza with mushrooms (the canned variety), onions, and green peppers. The Pizza Wife enjoyed the crunchy edge to the pie, but as a whole she didn’t think it was anything spectacular. However, it hit the spot, along with the chips, queso, salsa, and beer we consumed that evening. Who can beat that combination? 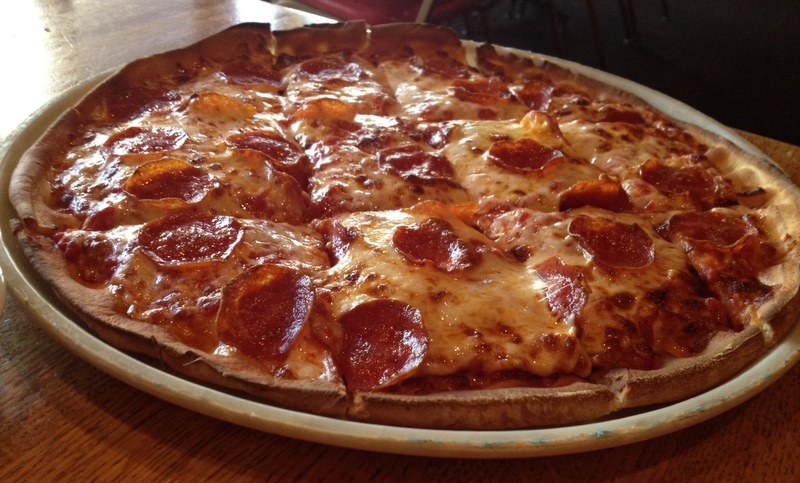 The pepperoni pizza came with those little red pucks of heaven floating on a layer of perfectly bronzed cheese. They cook the pizza just long enough to get the classic cupping action of the pepperoni, which makes them slightly crispy on their edge. If it weren’t for the doughy crust below the toppings, this would have been a pretty good pizza. As it was, it was a bit below average for me. The good: quick and friendly service, you can get Mexican food there as well! How would you rate Romeo’s Pizza? Click on the stars below! This entry was posted in Pizza and tagged Romeo's Mexican Food and Pizza. Bookmark the permalink. Wow. Romeo’s is just bad all around, at least the one in Bellevue is notoriously awful. Have you been to Orsi’s yet? I’m surprised there isn’t a review yet.